We’re all busy, and when it comes to staying fit and healthy, going to the gym isn’t always the best option. In fact, sometimes it just doesn’t make sense at all. Hitting the gym can be costly; both for your bank account and your precious free time. Gym memberships can easily amount to hundreds to thousands of dollars a year and even if you can afford it, the crowds can make the whole experience a negative one. If you don’t mind the crowds and the cost, the gym can be great and can definitely be worth it for staying fit, but there are many ways to get fit for much less! All that aside, getting to the gym can also cut into your time. It can take several hours a week to get to and from the gym, especially if you tend to go doing rush hour. And wouldn’t it be great to have the option to just work out in the convenience of your home? Take advantage of free workout videos - Youtube is filled with free videos available to anyone at any time. These routines give you a lot of flexibility, as you can do them virtually anywhere, without equipment or a gym. Plus, they are often created by some of the most experienced trainers in the country. Take a walk - Walking is the MOST underrated exercise. Without even breaking a sweat or thinking you are working out, you can burn over 250 Calories an hour! Going for a Sunday coffee? Save some gas money by going for a walk. You can also add extra steps to your day by parking further away or by walking around when on the phone. Adding just a half hour of walking to your day can help you stay in shape, and relieve the stresses of the day. Get your hands on some basic fitness equipment - Light dumbbells, a stability ball, and jump rope can all be used for a great home-workout. If you can’t afford equipment, ask family or friends if they have any workout equipment lying around that they’re not using (most people do). Get creative - This can actually get really fun. Think of items around the house that weigh more than a pound, but are easy to hold on to. Use them as weights by doing curls or squats. You can also use furniture as exercise equipment; try box squats or step ups on chairs. Get more ideas from these mini workouts! 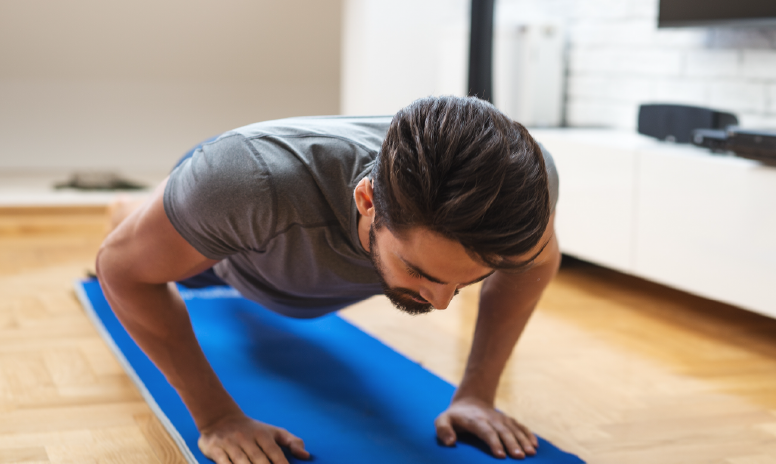 Do bodyweight exercises - Planks, push-ups, squats, jumping jacks, and step-ups are all great ways to get moving and keep the heart rate up. Here are 50 simple exercises you can do without any additional equipment. Your daily chores are playing double duty. Cleaning the house is actually a great way to get moving. Check out how many calories you can burn by doing housework with this calculator. the above is not medical or professional advice. If you have health concerns, are considering a challenging physical fitness routine or a significant change to your current activity level, you should consult a medical professional.